2013 marks 100 years since pioneering movie comedian Harold Lloyd made his first appearance on screen as an extra. 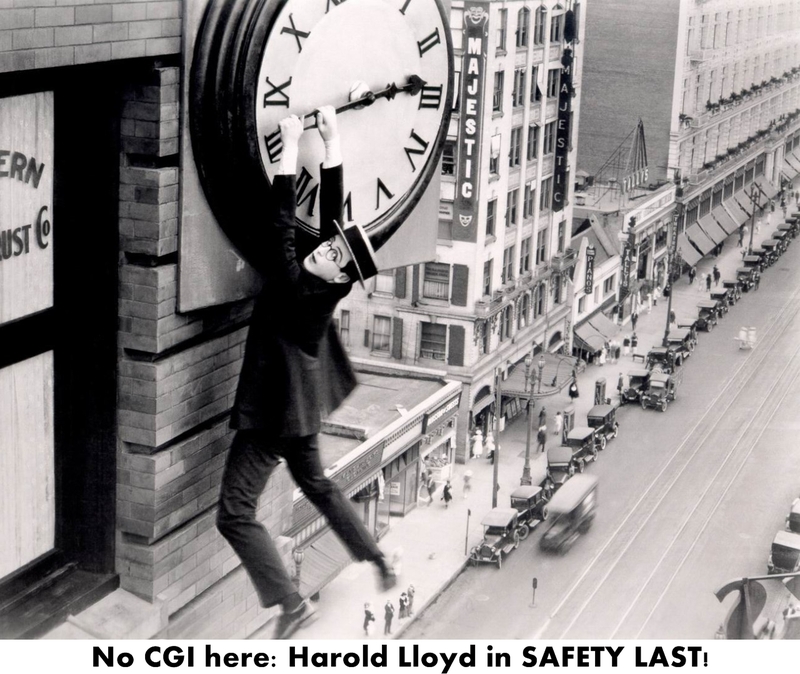 It is also the 90th anniversary of one of his greatest features, Safety Last!, in which Lloyd plays a genial department store clerk who scales the side of a Los Angeles building. Lloyd, who lost part of his right hand in a prop bomb explosion in 1919, performed his own stunts on the climb up the multistory building, one of the great feats of cinema. Lloyd’s granddaughter, Suzanne, was a teenager when her grandmother Mildred told her that her grandfather was making arrangements to leave her a fabulous gift. That present turned out to be his legacy and she has honored that wonderful bequest by making a life’s work of restoring Harold Lloyd’s 85 surviving titles and introducing his genius to new generations through DVD, TCM and theatrically. Suzanne Lloyd will be in San Francisco on Sunday, July 21 as the San Francisco Silent Film Festival presents Safety Last! as its closing night selection. I was lucky enough to catch up with her shortly before the festival to chat about the movie, her grandfather and his wonderful gift. Q: You’ve been involved in all of the restorations. Your grandmother costarred in a lot of the films, including Safety Last!, along with your grandfather. So when you are working on a restoration, what does that feel like? You are not just working on film history, this is also your family history. A: I started doing it when they were both alive. I was really young when I started on the film boxes at the estate. I was 15 ½. I was rewinding, wrapping nitrate film, checking it, checking prints, putting labels on cans, just really glamorous film stuff. It’s a responsibility, because somebody gave me their life’s work per se, their masterpieces of art. Film history is very important. It is America’s art form, which is now coveted by every country in the world. I don’t know how he really did it, but he kind of like trained me up and taught me and had faith in me. He knew his son wasn’t well. My mother wasn’t really well, so there was nobody else to punt to. He started kind of grooming me in a very subtle, but kind of Machiavellian – I’d come home from school and he’d send me down to USC to take classes. I was still in high school and he’d take me to go and see him lecture, then he’d ask my opinion and we’d talk about it. It wasn’t like, “You’re going to do this,” but they gave me a beautiful life and they raised me as their own child. And when someone gives you a gift, you’ve got to take care of it. Q: Did your grandfather tell you stories about making Safety Last!? With Safety Last!, he just had to recopy that emotion that he felt. Isn’t that what movies are about, trying to tell a story and put out your emotions and make people feel it with you? A: Oh, yeah, three stories and on top of a 12-story building, OK. Let’s not get really crazy here. It’s still pretty dangerous, and for man that has half a right hand. I’ve never heard of an actor, a leading actor, being injured or as handicapped as much as he was. Just mentally, to get through that is amazing. Q: What you do you think your grandfather would say if he could see now, 100 years after his screen debut, that his films are still being seen and appreciated? A: I think he’d be really thrilled. He’d be really thrilled. He’d be more crazy about all the digital technology, about all the computers, about all the 3D stuff that he could get his hands on, all the cameras that he could get his hands on. He wouldn’t have time to talk to us, he would be so busy. We would have to beg to have him take a breath, “Could you please sit down and eat something?” He’d have every computer. He’d just be plugged in. He would be all over the place. He would be so wild about that. And he’d be thrilled by it. He really would be, because he was always pushing to get to kids, get to college students. He left grants to build a sound stage at USC – I built that in his honor. He gave a great grant to the American Film Institute. He gave a grant to UCLA. He gave a grant to Marymount Loyola. He was always pursuing things like that to go ahead and to see the future and pass on the torch. He was very visionary like that and pushing the edge out. And especially how he felt about 3D. He loved 3D. He said that would be the next turning point of movies and it is. He shot over 200,000 3D photographs. He was a great photographer. I’ve done two books on his photography [3D Hollywood and Harold Lloyd’s Hollywood Nudes in 3D!]. Q: There are people who have some interests, but it sounds like he had a lot of interests. A: He painted, too. He was an oil painter. He had a lot of interests. He was a great reader. He loved literature. He loved mathematics. He used to play with the abacus all the time and do math combinations. He loved music. He used to play music so loud in the living room that it would shake the gold leaf off the ceiling. Q: What kind of music did he like? A: Any kind. I can’t say he liked any kind, although he did take me to The Beatles’ concert and The Stones’ concert and The Doors, so he progressed. He loved jazz. He loved opera. He loved classical music. That was probably his favorite, but he loved show tunes. He loved singers. All of it. He’d take me to the opera. When we were in Vienna, we’d go to concerts. He loved going to musicals in New York. He loved all of it. Q: Is there any one thing you always want people to know about your grandfather? For more information about the San Francisco Silent Film Festival, visit silentfilm.org. For more information about Harold Lloyd, visit haroldlloyd.com.